First, you believe the fuller video has completely exonerated the high school students. Second, you think that the video presents a more complicated narrative, one where we’ll never know the private intentions of the actors. Hold on to as much of the original “privileged, white racists” narrative as you possibly can without admitting that there are any ambiguities. If possible, let on that you can grok all of the intersectional conflicts at play and that, yes, those kids are still to blame. That was the conclusion of one of the editorial cartoonists for McClatchy, which runs over two-dozen daily newspapers. 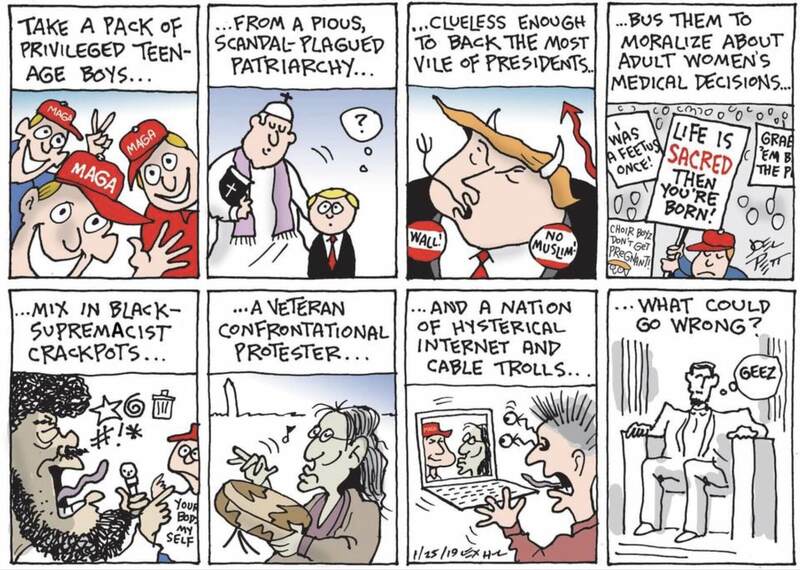 In the comic, drawn by Joel Pett of the Lexington (Kentucky) Herald-Leader, four panels are given over to how repulsive the students, the Catholic Church and Donald Trump are. A fifth panel mentions the racist Black Hebrew Israelites, one of the catalysts for the incident. A sixth panel kind-of-sort-of takes Native American activist Nathan Phillips to task, and a seventh panel complains about the online outrage (something Pett is in no waycontributing to). Then Abraham Lincoln weighs in and says it’s all contemptible. I suppose it makes more sense when we look at the comic, but only in the sense that the agglomeration of hot takes (including a condemnation of hot takes) sort of coheres. In other words, they had it coming. I’m going to assume this argument wasn’t made often in these pages in the run-up for the March for Our Lives, which was about minors moralizing about adult Americans’ constitutionally protected decisions, but this is just a guess. All in all, for a very assured take on a very opaque incident, the Covington Catholic kids — minors all — are blamed in five out of eight panels. Remember, in panel five, we see one of the kids with a “Make America Great Again” hat and a “Your Body My Self” T-shirt. I suppose we probably ought to be thrilled this editorial cartoon was published on Friday, by which point this was washing out of the news cycle and the media was either apologizing or trying to get everyone to forget they’d ever taken a position on it. However, it’s not materially different from other takes we’ve seen which have tried to hold onto the original narrative like Indiana Jones hanging off a cliff by his fingernails. And why? Because these minors were “privileged” and their politics didn’t match up with whoever was spewing vitriol. And yes, I don’t exempt the cartoonist here — attacking hot-take trollishness in a hot-take troll of a comic is merely recursive and ironic, not exculpatory. You don’t get a free pass to pick on kids because they wore MAGA caps. You don’t get a free pass to pick on them because you think their families, their school and their social circle are too rich and too white. You don’t get a free pass because you don’t like the Catholic Church or think they shouldn’t be participating in the March for Life. All of these things aren’t just appalling, they ascribe deeper motives to mere teenagers that facts don’t back up. But then, nobody much cared about the facts in this case at first: They saw a clip and it reinforced whatever what their preexisting prejudices were. When the full clip came out, some people continued to hold those prejudices within. Joel Pett, our cartoonist friend, is obviously one of them.